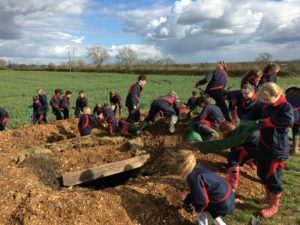 Year 6 preparing for their visit to the WW1 battlefields in France later this week, by re enacting ‘going over the top’ of our own Copthill trench. You will see from the footage how our structure has been extended over the years, as each year 6 group is able to experience a rather more hands on history lesson. Thanks to Mr Teesdale for the realistic smoke bombs and to Mr Willson for some seriously stern commands!